This is a sponsored post written by me on behalf of GiftCardRescue. All opinions are my own. I am a huge fan of giving (and getting) gift for the holidays. I don't understand the stigma about them because the person gets too choose what they want and I know I am giving them a gift they would actually enjoy! So it's a win, win. But we all like saving a little money, so how do you get discounts on gift cards? One way is to definitely check out GiftCardRescue! It's now easier to save on gift cards than ever before with GiftCardRescue.com. 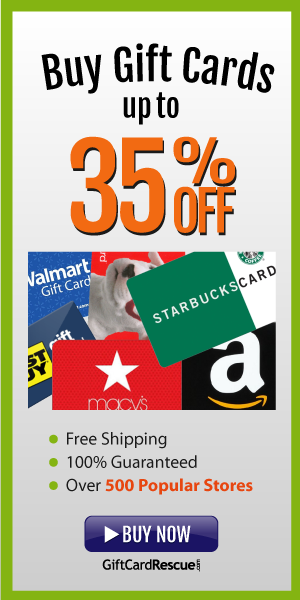 They sell discounted gift cards to over 600 merchants at up to 35% OFF. You can buy gift cards from all of the top restaurants and retailers! Walmart, Target, Starbucks, Best Buy, Lowe's, and so many more! But say you receive a gift card you don't want. Example, one year my husband and I received a restaurant gift card in his work's secret Santa exchange. It was a great idea, but unfortunately we don't live near that particular restaurant chain. So what do you do? Gift Card Rescue also buys unwanted gift cards and pays up to 92% cash back. Their company first appeared on ABC’s hit show, Shark Tank and is recognized as one of the most successful brands to ever land an investment on the show. They have been featured in The New York Times, The Wall Street Journal, CBS, NPR, Smart Money, Shark Tank, and listed in the Inc. 500 in 2013. I suggest checking GiftCardRescue out maybe buy discounted gift cards for the holidays and saving some money too! Do you like giving gift cards as gifts? What do you think of GiftCardRescue? I have few unused giftcards too! Guess its time to check them out soon & exchange for cards i could actually use! Who doesn't love gift cards?! I like the idea of getting a lot at discounted rates. When purchasing these as Christmas gifts it can become costly. This would be nice way to plan a head by purchasing these discounted card throughout the year. Hmmmm. I always worry that it's too impersonal a gift, but I'm trying to remember that it's okay to give gift cards. And I absolutely LOVE getting a good deal. I will definitely be checking out Gift Card Rescue. Thanks for the heads up! I never knew about this and what great way it is to deal with gift cards. I have a few of them which I don't really want to use and I will definitely check the site out..
Oh my word! Thank you for this post! I have received lots of gift cards to places not even in my state :| and I have a hard time seeing them, so this is definitely a convenient way to get rid of them without losing that much money!